Can there ever, really, be enough styles? With the unbridled success of the new Pack-It Specter Tech™ Series, customers are demanding access to all their favorite styles in the new Specter Tech fabrication. Designed with premium features for the outdoor adventure customer, the new Specter Tech™ collection offers ease of access with dual zippers, climbing rope inspired pulls, content visibility, webbing handles and long lasting durability. A new proprietary ultra-light bluesign® fabric was engineered to provide maximum strength while also addressing the sustainability values held by Eagle Creek customers. Available in both individual styles and a variety of sets and capacities to handle any packing list, the new Specter Tech™ keeps you traveling smoothly and confidently. Colors: Black/White, White/Strobe, and Indigo Blue. The new Pack-It Specter Tech™ styles are available now on eaglecreek.com. 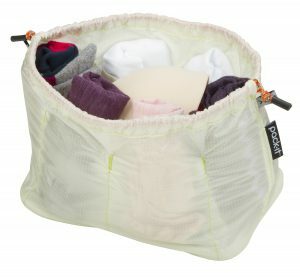 A lightweight travel savior for packing neatly, tightly, and quickly! 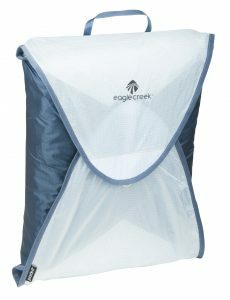 Capacity: Holds 8-12 shirts and pants; Weight: 9.3 oz; Size: 12 x 17 x 0 in. 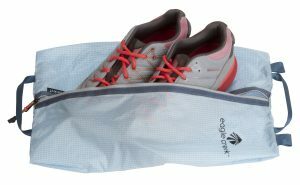 Ultra-light and durable shoe bags that will keep every spec of shoe dirt contained. Capacity: up to men’s size 13 hiking boots; Weight: 1.3 oz; size: 11 x 15.75 x 0 in. With six internal pockets, keeps your luggage constantly sorted. Perfect for all your smaller travel items such as cords, adapters, jewelry and more. Size: 2.5 x 4.5 x 2.5 in. Size: 2.75 x 6.75 x 2.75 in.